Epoca d'Oro wins it for Orfevre!!! Last edited by tachyon on Sun Apr 15, 2018 3:25 am, edited 1 time in total. 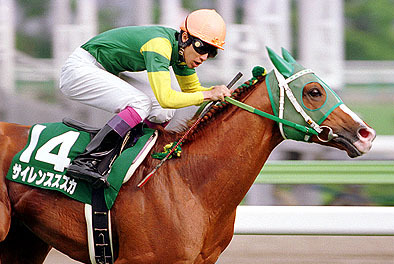 Unpredictable Orfevre(JPN) sired his first classic winner & second G1 winner from his first crop. 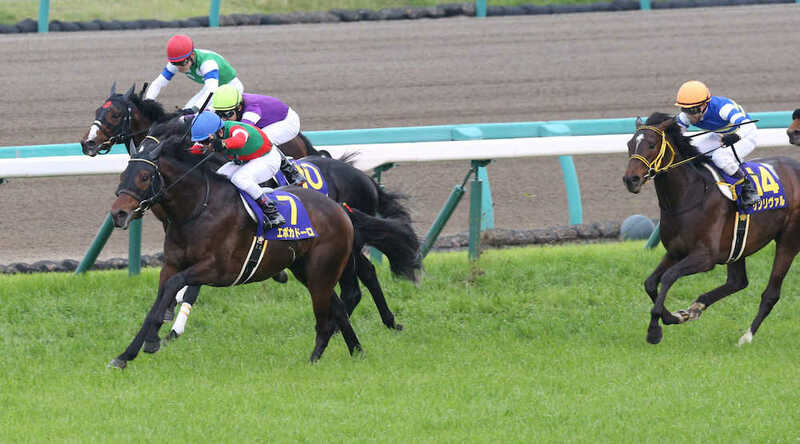 Oka Sho winner Almond Eye(JPN) (Lord Kanaloa) will be pointed to the Yushun Himba (Japanese Oaks) after all. Treve wrote: I wasn't sure where else to put this... but a while back I saw a trailer for a game called "Umamusume: Pretty Derby". It has been adapted into an anime which premiered April 1st. At the time I didn't know what kind of game it would be like but since I recently found out about the show I am giving the first two episodes a watch. What I did find out prior to watching via wiki is that all the horse girls are named after and based on famous Japanese race horses. I recognized about half to 3/4 of the names. Similarly, Special Week has dark brown hair and a streak of white in her bangs (I assume to reference the blaze) and wears purple and white hair accessories. They also replicated/respected Silence Suzuka's run style in the first race they've shown so far! The concept is a little bit odd, but anyway I thought it was a cute nod to Japanese legends of the turf. Saw the first episode, and I'm not sure whether I love it or hate it.... but thanks! For bringing this to my attention. 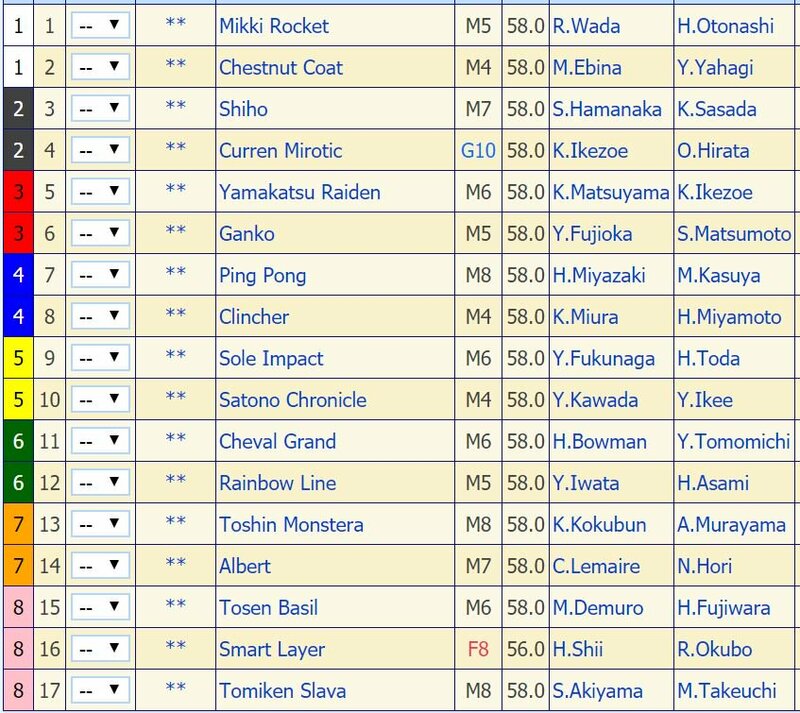 First three finishers in the upcoming Yushun Himba (Japanese Oaks) will be granted automatic berths with entry fees waived and assistance to travel costs to the G1 Prix Vermeille at Longchamp Sep 14th this year. I suspect that these will become attractive incentives to those horses who are considering their trips to Longchamp. 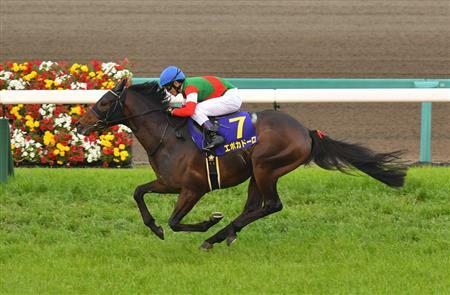 Lucky Lilac(JPN)(Orfevre) has already been nominated to the Prix de l'Arc de Triomphe Oct 7th, too. Oh my gosh look at these faboo little wheely racers! I wonder if they're like pull-back cars? Anyway now I want them... there's Buchiko and Gold Ship and Deep Impact and I dunno the rest but they are SO COOL! Jockey Yutaka Take took part in the episode 5 ''Japanese Derby'' to play himself by voice!! You will also see an exciting stretch battle between Special Week and El Condor Pasa. I have to say Gold Ship’s quirky antics really are growing on me especially with regards to Meijiro McQueen had me giggling. In other news, what the heck is up with Al Ain...? Is he tired of being a racehorse, or just determined to become Gold Ship 2.0? 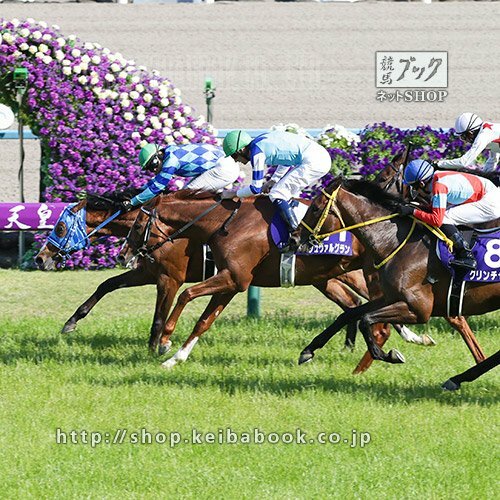 Rainbow Line(JPN)(Stay Gold) won the G1 Tenno Sho Spirng. 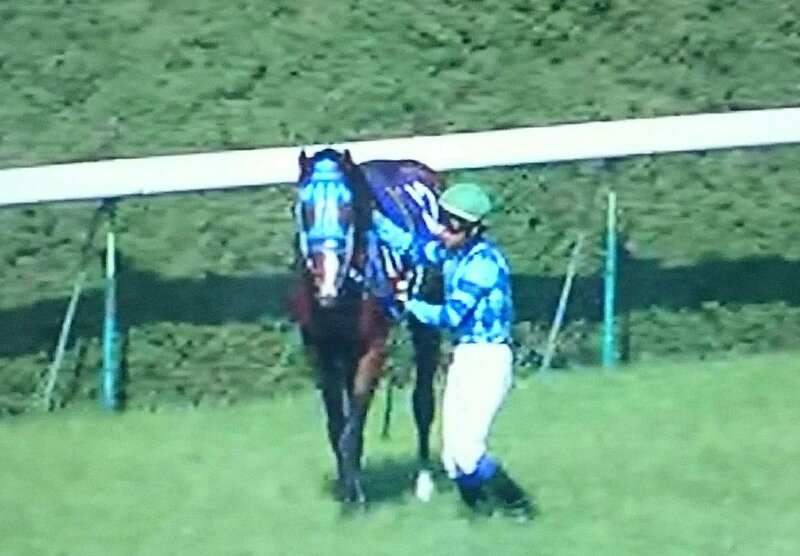 But his jockey Iwata dismounted soon after the race. After the race, Rainbow Line was found to have lameness in his right foreleg and was transported without making a victory run. needed late kick to reach the front before the wire. I’m worried about the horse. I just hope he’ll be able to run in the next race.'' commented jockey Yasunari Iwata. ''It’s great that he was able to win the race but I'm concerned about his condition after the race. I hope to give him the best care as possible so that he can recover for his next race.'' added trainer Hidekazu Asami. What a gallant run by the son of Stay Gold! Get well soon, Rainbow Line, please!!! But tachyon, please keep us up to date about Rainbow Line, I hope it is just something benign like a temporary soreness. Get well soon! Argh I fell asleep and missed it, but now I'm kind of glad I did because I would have worried about Rainbow Line all night. Such a shame, reports were he was working soooooo well. Please do let us know any updates you find about him, tachyon! 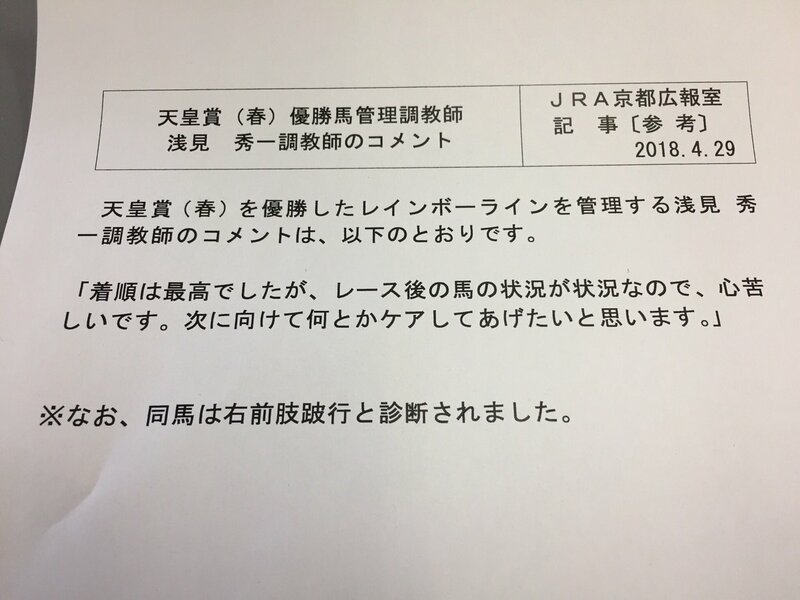 tachyon, can you tell us what this statement from the JRA says? The general translation I've seen is just "lameness in right foreleg" but everyone seems relieved so it seems not a terrible injury? But they aren't speaking in specifics so it's hard to know. lurkey mclurker wrote: tachyon, can you tell us what this statement from the JRA says? The general translation I've seen is just "lameness in right foreleg" but everyone seems relieved so it seems not a terrible injury? But they aren't speaking in specifics so it's hard to know. 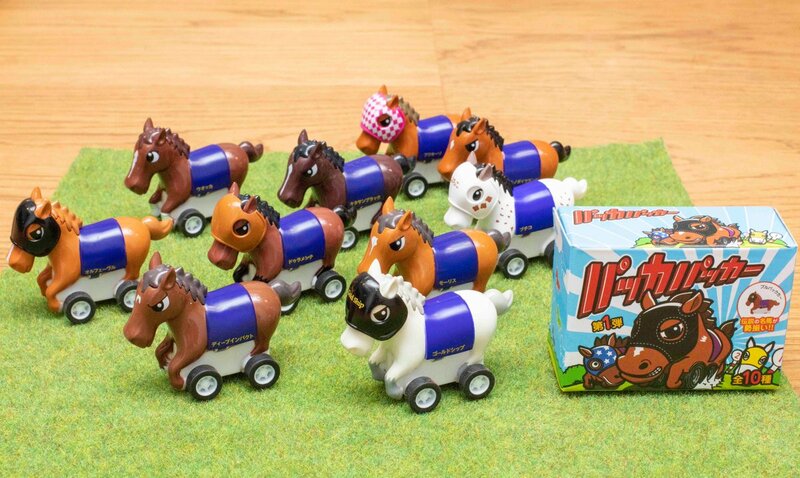 ※The horse was diagnosed with lameness in his right front leg. That JRA statement made us believe that his injury may not be life-threatening. Last edited by tachyon on Sun Apr 29, 2018 6:30 pm, edited 2 times in total. Thank you tachyon! Hopefully good news will come soon. Rainbow Line will have a detailed examination at Ritto Training Center on Wednesday.